From Tri-County Regional Center - an agency to service people with disabilities. For those who enjoy sports and friendly competition, there is some exciting news coming for folks in the Santa Ynez Valley. Special Olympics Southern California will begin offering programming in Santa Ynez and Buellton in the spring of 2018. 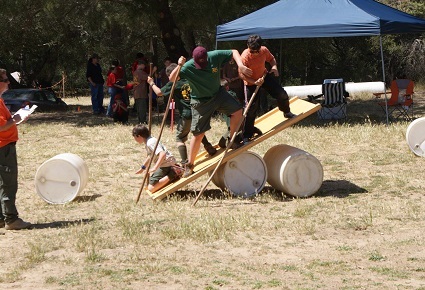 This is a partnership and collaboration between Special Olympics, the City of Buellton and the City of Solvang Parks and Recreation Department. Special Olympics Southern California offers activities to individuals with intellectual disabilities in sports such as flag football, bocce ball, swimming, soccer, volleyball, and golf. The sports rotate seasonally with tournaments held several times a year. There are plans to include cheerleading as well as a wellness program that focuses on healthy eating and exercise habits. Basketball is one of the spring sports. Once the practices have concluded in the Santa Ynez Valley, the teams will go to the big Spring Tournament usually held at the University of California Santa Barbara (UCSB) Thunderdome. Last year’s spring basketball tournament at UCSB included over 400 athletes from Southern California. All Special Olympic programs are free of charge to participants and a great way to get some exercise and meet new friends. The players and teams may go on to compete County-wide, State-wide or even internationally at the World Games. Special Olympics pays for the athletes' travel expenses. The Santa Barbara region of Special Olympics currently serves over 1200 children and adults. The program is open to all people with intellectual disabilities from age 8 years and up. Most of the players are adults, but there is no upper age limit. The oldest Santa Barbara participant is 72. There are over 500 volunteers assisting with coaching and fundraising events throughout the year. Special Olympics has recruited a head coach, David Ibsen, for the Santa Ynez Valley basketball team. There are opportunities for assistant coaches and volunteers are needed. If you are interested in signing up to play basketball, visit the Special Olympics Santa Barbara website at www.sosc.org/sb for more information. If you would like to volunteer to become a coach, contact Tim Ballaret at 805-884-1516 x 104 or tballaret@sosc.org. If you are interested in volunteering to cheer this new team on during practice or games, contact Jerrie Domingos at 805-688-5041. Roundtables are fantastic opportunities to learn from Scouting professionals and volunteers on programe ideas, implementation, and changes. Normally these meetings are held monthly. 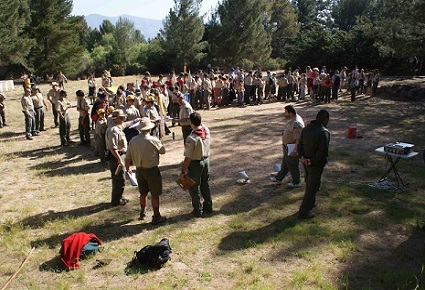 Because of the smallness of Cachuma District in size, but not in the heart of Scouting, our volunteers can attend Roundtable sessions in either Santa Barbara or Santa Maria. Santa Barbara Roundtables are held at the Santa Barbara LDS Church on Santa Barbara Street on the 2nd Thursday of each month at 7 pm. Check out the South Coast District page. For the Live Oak District Roundtables, check out the Live Oak calendar of events. Cachuma District now has integrated webpage in conjunction with the Council, Rancho Alegre, and the other four Districts. We want to invite you to submit articles, event information, and pictures for Cachuma District activities. Currently, Council Webmaster Wayne Rascati from Goleta is putting our page together. You can contact him at RanchoAlegre@cox.net. He would particularly like pictures (landscape) of Cachuma activities to put in the rotating picture show at the top of our webpage. 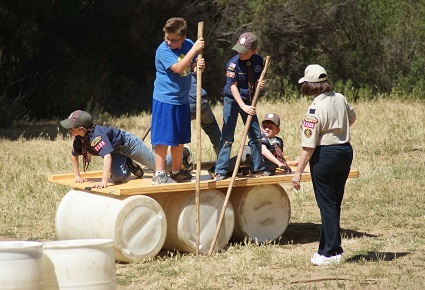 The pictures you see now are from our joint Camporee with Live Oak District several years ago. Also, Cachuma District's own Brad Ross is the editor of the Council Newsletter. If your adult leadership and parents are not receiving this newsletter, please send their name and email address to Wayne at RanchoAlegre@cox.net. 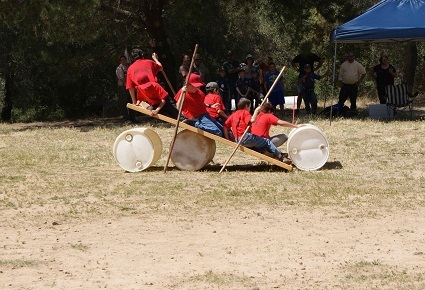 Following is a list of upcoming events in the Cachuma District. To register and/or pay for this event, click on the event. 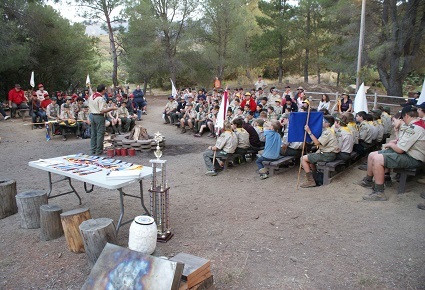 The District Roundtable is your opportunity as a Scouter to gather with other volunteers in the district, learn about upcoming events and activities throughout the Council, discuss coming changes to the Scouting program, share ideas and succcesses with other Scouters. We are actively seeking attendees at our monthly sessions To find out more about Roundtable and Cachuma District activities, contact Scott Oldenburg, District Executive for the Cachuma District at 686-5167. Do you enjoy camping under the stars, rafting a whitewater river, or hitting the trail afoot, on a bike or even on a horse? 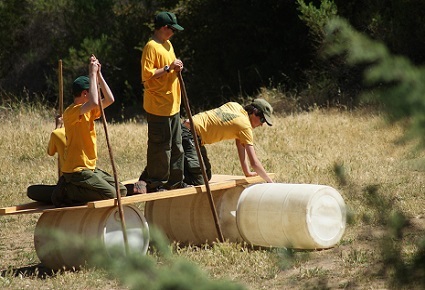 Can you pitch a tent, find your way, and bandage an ankle using only materials in your pack? If so, the National Outdoor Badges are for you. 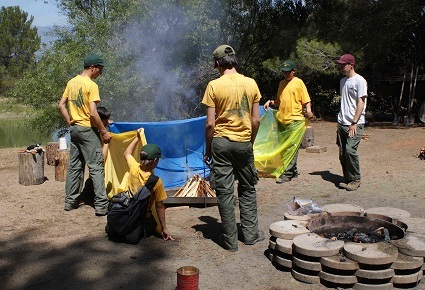 If you are a Boy Scout, Varsity Scout or Venturing Scout and think you are tough and disciplined enough to hike or ride the miles, camp the nights, and run the rivers or lakes then visit the click HERE to see how to earn the new National Outdoor Badges or possibly the National Medal for Outdoor Achievement! 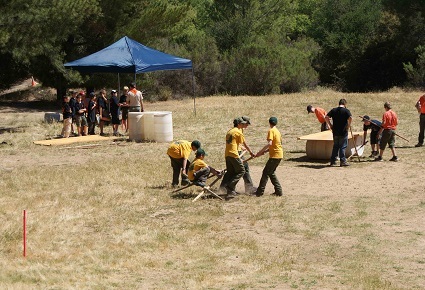 This page along with its associated District Calendar and District Merit Badge Page is maintained by your District Executive and/or his designee. If you note any errors, omissions, or problems, please report them directly to your District Executive Glen Goddard.